"Goin' to North Carolina, and from there onto China"
About two weeks ago, I went to two concerts at UNC-Chapel Hill's Memorial Hall that were tied to a conference on Music and the Global America South. I hadn't heard any of the acts before, but they were both pretty exiting, fun, and musically interesting, so I thought I'd say a few words about them. The first concert featured two groups, the Carolina Chocolate Drops and South African singer and guitar player Vusi Mahlasela. On stage, the Grammy-award winning Carolina Chocolate Drops are very likable and unassuming. The four of them sit down to perform, perhaps evoking playing on a old-time Southern porch. They all play a few instruments, at least one being some sort banjo (I've never seen so many types). Dom Flemons (guitar, banjo), one of the group's leaders, is quite a character. He dances while he plays bones and just has a high-energy singing style. Rhiannon Gibbons (fiddle, banjo) was classically trained in voice, and you could tell she knew how control her breath. Despite their mostly Southern repertoire, probably my favorite piece was a Scots-Gaelic mouth-music medley, to which they added bones, bass drum, and cello. Vusi Mahlasela is an outspoken (outsung?) advocate of the end of apartheid, and most of his songs were about African unity. Unfortunately, the words were either in a foreign language or hard to understand, and the music from the different tunes blended together. Perhaps the most interesting number of the concert an encore featuring everybody, "Diamond on the Soles of her Shoes" from Paul Simon's Graceland. Many view Graceland negatively because Paul Simon didn't give enough credit (or proceeds from the best-selling album) to his South African collaborators . But it was interesting to hear the music played by a South African band and I could hear the similarities with the rest of their music (the bass player in Mahlasela's ensemble played on Graceland). The second concert was with Abigail Washburn, Kai Welch, and Wu Fei. Banjo player Abigail Washburn (who, I found out, is Béla Fleck's wife) was the headliner, having just made her second album, City of Refuge. But I had the feeling this show had evolved since the initial announcement. Kai Welch (who collaborated with her on City of Refuge) brought his trumpet, harmonica, guitar, and also digital looping to the show. Washburn got the conference to fly in her friend Wu Fei, a guzheng (Chinese zither) player from Beijing. Washburn has spend several years in China and had really fallen in love with the culture. While they performed several songs off the album, they also did some crazy things! For the second half of the concert, they convened in what they called "The Wu Force," which was as much an art-concept as a musical group. It was a bizarre mix of Southern and Chinese folk music. Not just clogging to Chinese folk songs (which they did), but some real genre mixing. It was true music without borders, and I felt like I was experiencing something that had never happened before, which was also exciting. One example of their mix was the song "Uyghur–Gaga," which mixed elements of the Chinese sub-culture Uygher's music and Lady Gaga's music. 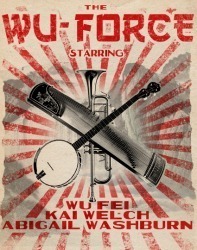 The Wu Force exploited one musical feature common to both Appalachian and Chinese traditions: pentatonicism, which is using a scale that only has five notes. Most often (including this case), the pentatonic scale means basically a major scale with the half-steps removed (the 4th and 7th degrees), or the five black notes on a piano. It turns out that many melodies in both traditions are based on the same five notes, though the style in which the notes are sung are very different. I think the almost-seamless mixing was possible because of this correspondence. Have you seen these groups or heard their music? What do you think? If you are interested in Chinese/Appalachian hybrid music, a friend recently told me about Matteo, a group that plays American music on Chinese instruments. Maybe I'll include some of these instruments on a future Noteworthy Instruments post. Speaking about going to China, I am! In about 10 days, I'm headed to Hong Kong for a week of fun and culture. Maybe I'll buy an exciting musical instrument to add to my collection. While completing his doctorate degree in voice performance at the University of Michigan, Brian Tanner frequently stopped by Peter's study carrel in the music library to distract him from his serious musicological studies. Like Peter, Brian is fascinated by the intersection of scholarly research and pop culture. Also like Peter, Brian apparently cannot get enough of college, so he is currently in the MBA program at Brigham Young University. Tweet him at @briandtanner. I thought this was brilliantly funny concept—take a downer song in a minor key and change it to the major (here's the original). Despite the switch, the end product doesn't really feel all that much "happier"—it's still about a crisis of faith and a severed relationship (at least I think, but it can be hard to parse Michael Stipe's oblique lyrics). The way this video plays with major and minor invites the listener to question the emotional preconceptions we have about each. Major and minor are but two of the modes that exist in tonal music. Simply put, a mode is a way of organizing pitches into a scale. There are seven total modes, each built with a different pattern of intervals between the notes of the scale: Ionian (also know as major), Dorian, Phrygian, Lydian, Mixolydian, Aeolian (also known as minor), and Locrian. * Although there are seven musical modes, the major and minor modes are by far the most common. "Dorian…has the liveliest melody of all, arouses the somnolent, refreshes the sad and disturbed…[it is] like the Sun, who is deemed first among the planets… the foremost musicians today use this tone the most." "Phrygian…not wrongly attributed to Mars…moves to choler and biliousness… loud words, hideous battles, and bold deeds suit this [tone]." "Mixolydian…has more in common with Saturn…shows itself with stentorean voice and great shouts, so as to be a terror to all." Just when Schubert gets to the saddest lyrics of the song he unexpectedly switches over to the major mode. By switching to the supposedly happier mode at a moment when the sentiment is the saddest, Schubert somehow makes the moment even sadder than it had been when it was in the minor mode because it now feels delusional and hollow. Another great song cycle by Schubert, Die Schöne Müllerin (The Beautiful Mill-Girl), has two songs back to back in which the protagonist sings about how his fickle lover (fickle lovers are staples of Romantic-era songs) is fond of the color green. The first is called "Die liebe Farbe" ("The Beloved Color") and the second "Die böse Farbe" ("The Hated Color"). Judging by the titles alone, one would reason that the first would be in the major mode and the second in the minor mode, but Schubert does just the opposite, and as a result the first song sounds more pathetic and the second more unhinged than they would if they were written in the expected modes. This only has two chords, B major and B minor, and it undulates between them so freely that the line between major and minor becomes blurry. Radiohead has a reputation as a cerebral band that writes music that takes multiple listens to sink in, and their refusal to resort to the emotional shorthand that the traditional use of major and minor modes affords may be a key reason why. Can you think of other pieces of music that challenge our emotional preconceptions about the major and minor modes? Feel free to leave a comment below, or to tweet at me (@briandtanner). And thank you, Peter, for having me on as a guest. *This Wikipedia article actually does a pretty good job of describing how the modes are formed and how they differ from another. **The modes of the Renaissance are not quite the same the same as our modern modes, but confusingly they share many of the same names. The plush, white cover of David Byrne’s How Music Works (San Francisco: McSweeney’s, 2012) proclaims the book an amateur’s sweeping guide to an elevated art, like a classy handbook for avid cricket fans, democratic yet capable of explaining the most complex in layman’s terms. The simple computer volume logo that accompanies the title reinforces this impression. Byrne open his arms with his sweeping title, claiming to explain how all music works for everyone, and, to be fair, he puts on a good show. 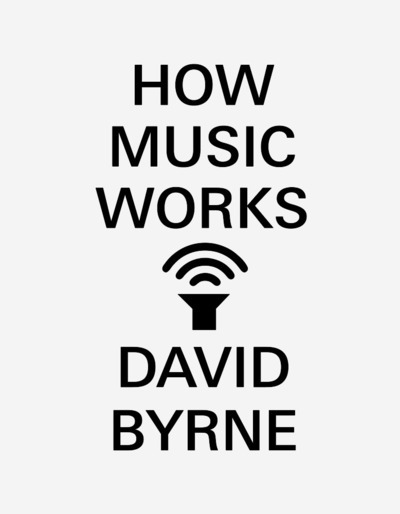 Perhaps the book’s title should be instead "How Music Works (for Me),” considering how much time Byrne spend talking about his own experience making music. Several chapters focus almost completely on this. This memoir-style storytelling may be exactly what fans of Byrne’s and The Talking Heads’ music are looking for, but Byrne does not always manage to make explicit how his reminiscences tie to the book’s supposed theme. Though uncritical of himself (not that we would expect him to be critical), Byrne thankfully takes a path less egocentric and more utilitarian than many other memoirs. Byrne in no way ignores the book’s title, however—he alternates memoir chapters with bigger picture explorations about musical context, technology shaping music, the business of music, amateur music making, and psychoacoustics—an impressive range of topics for one book. Within the chapter level, however, Byrne is a bit rambling and unfocused, at times oversimplifying or making sweeping gestures not quite supported by his facts. Despite the organizational problems, Byrne deftly and impressively summarizes a wide range of scholarly activity on music from antiquity to the present. He is obviously well read. He is fairly good at presenting an even-handed argument, making space for both sides of an issue even when he does not agree. Every once in a while (seemingly out of nowhere), Byrne will say something remarkably insightful and pithy, enough to justify reading the rest of the book. The best part of How Music Works is the chapter on business and finance, an extension of Byrne’s 2007 Wired article. This informative chapter sheds light on the mysterious inner-workings of the business of music with personal examples in Byrne’s best attempt at tying his life to the book’s title. His chapter on amateur music making, though as uneven as the rest of the book, is also engaging, providing an interesting argument for the renewed funding of arts programs across the nation. In his excitement proclaiming the virtues of musical democratization and vilification of the passive consumer, however, he does seem to forget (in spite his very detailed description of CBGB's neighborhood) that some music is inextricably connected with drugs and crime. Byrne’s book, rambling its merry way to its sudden ending, mostly fails to live up to the cover’s promise of secrets revealed. Many of his insights, however, definitely deserve a closer look. How Music Works would make an excellent blog (I know my favorite posts), but falls short of being a cohesive book. Did anyone else read the book? What did you think? I've mentioned Jonathan Coulton on this blog before, and many of you know I've presented academic conference papers on him. Coulton's is an interesting music business case because he's one of few popular musicians (maybe the first) to make a living without signing onto a record label. Instead, he sells his music online (through Creative Commons licenses), tours, does cruises, and writes music for video games and TV shows. Maybe sometime I'll get around to posting highlights from my Coulton paper, but for now I just wanted to highlight a current event. Other sources can present the situation better than I, so I'll give a brief overview with links if you want to know more. Last week, Fox TV's Glee did a cover (popular music's word for a new arrangement of a popular song) of Sir Mix-a-Lot's racy "Baby Got Back." "So what?" you say. Well, Glee's version sounds suspiciously like Jonathan Coulton's 2005 cover, borrowing the melody that Coulton wrote (the original was rapped) and even possibly the original audio. And Fox did not contact Coulton or site him in any way. Someone from Fox told Coulton he should be grateful for the exposure—except the the Glee's viewers have no idea Coulton was even involved. 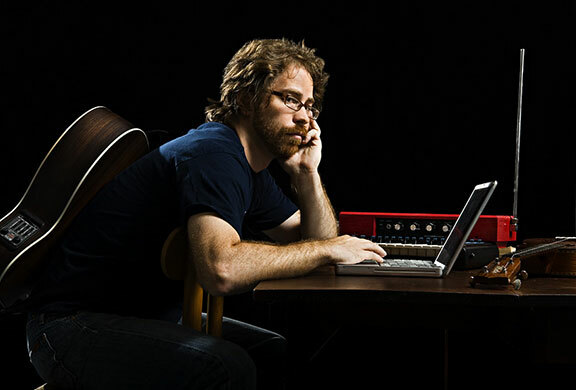 Has Jonathan Coulton been robbed? Can he do anything about it? The answers are complicated. Music rights have always been a problem since the first person heard a melody and then performed it somewhere else, claiming it as their own. In this case, since both Coulton and Glee's versions are covers, they license the music from Sir Mix-a-Lot. Copyright does not protect these covers, so Coulton does not have recourse from that angle. Now, as he explains on his blog and NPR's On the Media, Coulton does have copyright protection on his original sound files—which Glee may have used. For more about the copyright angle, you can read this story from the Economist. So what has Coulton done in the mean time, while his lawyers figure out the details? He has re-released his original cover of "Baby Got Back," retitling it "Baby Got Back (In the style of Glee)" and asked fans to purchase it on iTunes, while donating the proceed through February to charity. So far, his cover has hit the top 100 downloaded iTunes tracks, which Coulton thinks is "amazing and hilarious." Did Coulton do the right thing? Is Fox to blame? Is this an issue that should be dealt with in the next iteration of copyright law? Comments are welcome, as always. P.S. Those of you who read this blog through an RSS feed should click over to the site and check out the hilarious and fun covers in the Featured Vocab box this week.